Today I’m writing this sitting in my first class seat on a long distance bus to Buenos Aires. A pleasant experience with fully reclining seat-beds and champagne served with dinner. Last night, for the first time, we’ve experienced a proper sub-tropical electrical storm. Quite a spectacle, like nothing I’ve seen before. The night sky was simply alight for hours with multiple back to back lightnings and quite bizarrely it was all completely silent. Afterwards the heavens opened and the rain came down so heavily that quite literally it transformed roads into little rivers of flowing water. 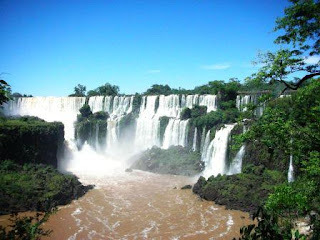 On the way from Florianopolis we stopped for a couple of busy days at Iguaçu Falls, one of the wonders of the world. We had 2 nights at Foz Iguazu on the Brazilian side where we had a panoramic view of the falls and 1 night at Puerto Iguazu on the Argentinean side where we had a closer look at the most important parts of the falls and took a river boat close to the falls to get completely soaked. The Brazilian view of the waterfalls was our favourite, even thought most of the falls actually reside in Argentina, but the panoramic view from the Brazilian side is quite spectacular. The Puero Iguazu town is, hoverer, much friendlier and nicer than Foz and you can get a feel for the difference between Argentina and Brazil immediately after crossing the border. Apart from al the excitements of the waterfalls viewings we’ve been reasonably busy since last update: we visited the Itapu dam (the biggest water electric plan in the world), which was a little bit disappointing, crossed the boarder into Paraguay for a couple of hours, which was even more disappointing. On the last day in Florianopolis I’ve tripped and fell over on the run so my running has not been going well since, but managed 11k yesterday so hopefully things will be better now. Weight is staying fairly constant. Hope things are well back home.